This is a recipe I come back to time and time again. 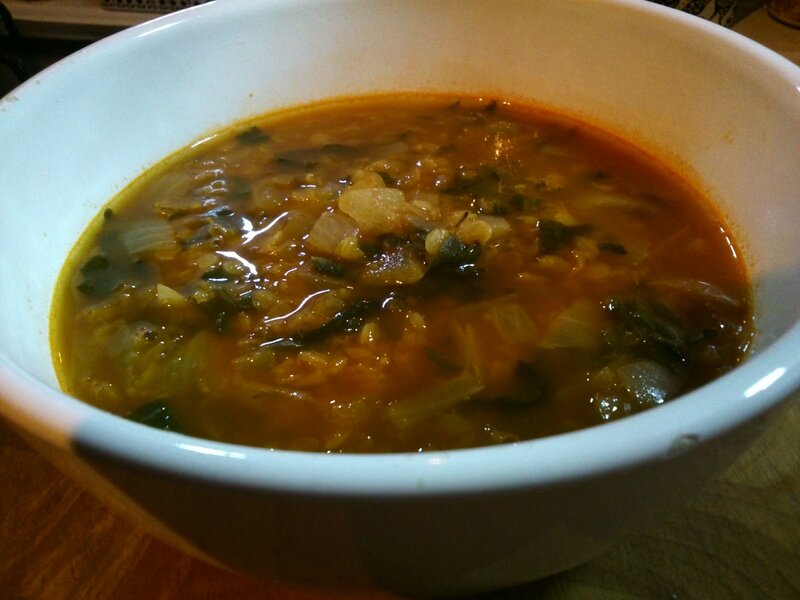 It’s a rare day that I don’t have onions, red lentils or frozen spinach in, and with the addition of smoked paprika and a little thyme, it’s a soup that always seems to taste much more complex and satisfying than the sum of its parts. I sometimes add different vegetables, as I mentioned here, and the smoky flavour can also come from liquid smoke, or even chipotle peppers. And the best thing about this soup, is that it takes barely 20 minutes to make! For something so tasty and nutritious, that’s a fact that makes me very happy. Heat the oil in a small saucepan and fry the onion for 4 to 5 minutes on a medium heat until browning around the edges. Make sure to stir so it doesn’t catch on the bottom of the pan. Add all the rest of the ingredients apart from the salt and pepper, and bring to the boil. Turn the heat right down and simmer for 10 minutes or so, until the lentils are tender. Season to taste. That’s it!